The subsequent images were taken at the National Park Neusiedlersee Seewinkel which is located in the south eastern corner of Austria. The page deals with Black-tailed Godwits (Limosa lomosa), birds which appear here for breeding purpose as also as migrating guests. Black-tailed Godwits belong to the Tringinae group. Most photos of this page from April and May 2003. Black-tailed Godwits are long legged and elegant birds. They have a long and straight bill. During courtship season when showing the nuptial plumage, head, neck and chest are coloured maroon to rusty red. The underpart and side is white with blackish paintings. When flying, legs overhang the body significantly. Female birds are a little bit larger than male ones and have longer bills too. They pick and poke in wet marsh territories to find their prey. Best success they have at shallow pool areas. Crows and Gulls sometimes attack the nests. In case of breeding communities of Godwits together with Redshanks or Lapwings all defend together. Because of their breeding in cultural grounds, sometimes accidents may happen. Either by being crushed underfoot by cows or by devastating the nests sometimes together with the brooding birds by mowing vehicles. Africa is the place where most of European populations overwinter. The breeding areas get occupied between mid of March and mid of April. After breeding, the birds migrate between July and September. 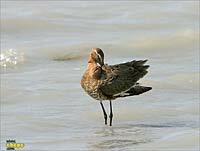 Black-tailed Godwits stride slowly and lift their legs accentuated. Foraging preferred at wadeable waters but also outside of the wet element. Click on preview thumbnails for enlarged presentation! During mating season the male birds show a lot of artistic flight performance. After landing they keep some seconds their wings spread upwards, showing the white underside. Tail and plumage spreading may be courtship or threatening behavior. Brood period is second half of April. The male bird builds the nest in the growing grass and cover it with smooth blades. At the Darscholacke lake Black-tailed Godwits are frequently seen. 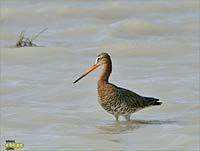 They have a body length of about 40 cm and in contrast to Bar-tailed Godwits a straight bill shape. When watching the birds, one may also observe plumage and body care activity beside searching for nutrition. Here the wing underpart is treated. Bathing is a regular part of body care. A helmet of water covers the bird's head and neck during those extensive water games. Thanks flexible neck and long bill, nearly all body parts may be reached for plumage care. Black-tailed Godwits also live in meadow grounds cultivated and used by humans intensively. 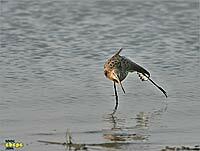 The bird stands in the leg deep water and even puts head and neck under water when searching the ground for prey. This one is a nice view documenting the shoulder coloring. The legs are dark, the bill base is orange and to the end it gets more and more dark. For sleeping purpose they prefer sand or mud banks.